I recently began looking for a good backup option for my WordPress sites. In the past, I’ve always performed WordPress backups manually. But times change. I’ve managed to get more website clients over the past year. And while it’s no big deal to manually backup a few sites every week, that changes once you have a dozen or so to handle. I also got married this past year and really want to make sure I’m spending as much time as possible with my family instead of my website business. When I look for new WordPress plugins, I always start with the free versions. While I have no problem paying for a premium plugin, I like to try free versions first. It’s entirely possible a free version might have everything you want. Because premium plugins typically have many additional features, they tend to be larger and might bog down your site with options you won’t even use. Most premium plugins have a more limited free version you can use. I prefer this because it lets me test-drive out the developer’s code and ensure there aren’t any major flaws. You can also use a free version to test out how responsive the developer is for support requests. If they’re good with the free version, you can be confident in their abilities to support paying customers. The plugin I ended up using? UpdraftPlus Backups. It’s lean, it works, and you can do most of what you might want with just the free version. It met all of my needs and much more. Before I talk about UpdraftPlus Backups in detail, it’s prudent to note that there are other options. The popular WordPress plugin, JetPack, offers backup options and many folks opt for that one. JetPack is one of the most highly used plugins made by the same people who make WordPress. One of the reasons I didn’t use JetPack is because I don’t make use of 95% of the features it offers and it’s a huge plugin. Websites run best when kept as lean as possible, so sitting on plugins with a lot of unused features is something I like to avoid. I can’t say enough about this plugin. For my purposes, the free version provided everything I needed and more. In fact, the list of options in the free version is likely sufficient for most people who run their own websites. The free version allows you to take backups on demand or at set intervals, though you can’t set the exact time unless you have the paid version. You can also have the backups go to a variety of cloud storage providers such as Dropbox or Google Drive. You can even send backup files to an FTP location. UpdraftPlus also lets you set the number of restore points you want to retain and handles deleting old restore points automatically. They even have their own online storage service called UpdraftPlus Vault (it’s a premium feature). Backups mean nothing if the restores are unreliable or difficult. UpdraftPlus has a super simple restore process. If you just need to roll your site back to a previous point in time, you simply navigate to existing backups and click the Restore button. It’s that simple. For my sites, I typically do a backup every day and keep them for 30 days. If your site got completely bricked and unrecoverable, you can still restore it. 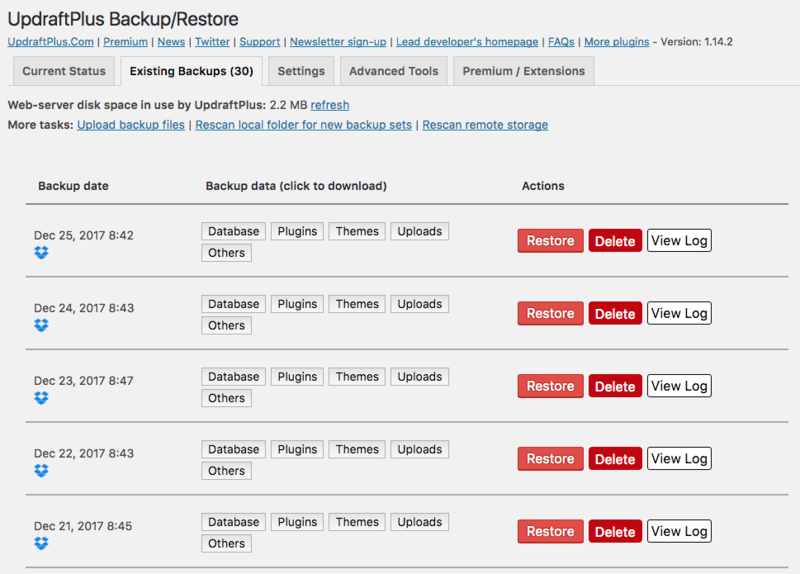 All you have to do is start with a fresh install of WordPress and reinstall the UpdraftPlus Backup plugin. Within the plugin, authenticate to the storage location that contains your backups. Once you’ve reauthenticated, you can rescan the storage and then select the restore point you wish to use. From there, it’s no different than a site rollback. The makers of UpdraftPlus also make a bunch of add-ons that you can buy to add functionality. There’s an add-on that allows you to make complex backup schedules. There’s also one that allows you to configure backups to save to multiple locations. To be honest though, at $10-$15 each, you’d be better off just buying the premium version which includes all add-ons. As of the date of this article, a 2-site license is $70. The best deal, however, is the unlimited site license which is just $145. I run over 20 different sites so the $145 is well worth it. 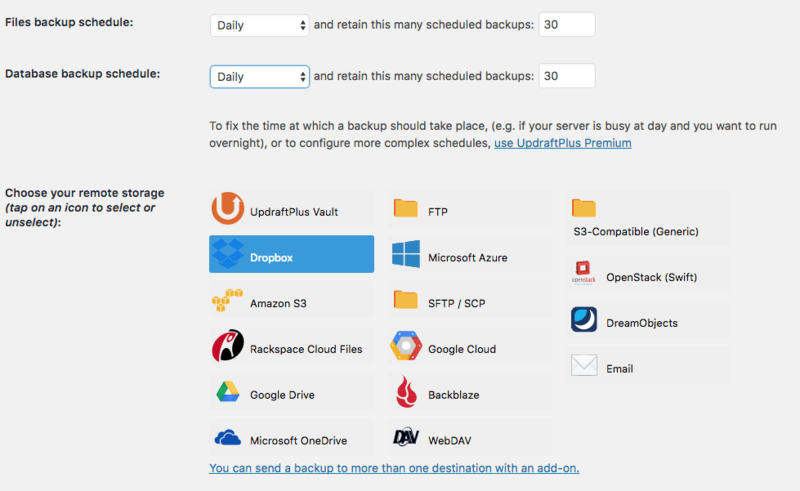 UpdraftPlus Premium also comes with a 1-year subscription to their own cloud storage called UpdraftPlus Vault. Unfortunately, it only includes 1GB of storage space which doesn’t really amount to much. Even if you don’t have a large site, if you want to keep a week or two worth of restore points, you’ll blow through that storage in no time. If you have a smaller site and you’re using an image compression plugin such as Smush, then it might be ok for you. Having your backups squared away is a great feeling. If you’re not backing up your WordPress sites regularly, don’t wait until it’s too late. You can do everything you need for free. In my next article, I’ll be talking about taking it to the next level with UpdraftCentral. Check back soon! Do you use something else for your WordPress backups? Let us know in the comments. Just installed this on the church website I maintain. Quick and easy setup and execution! Thanks for the recommendation. Glad my info is useful 🙂 You know what’s crazy was 2 nights ago was the first time I really ‘critically’ needed to restore a site from backup outside of test sites – and it worked perfectly. I wanted to temporarily try a new theme and it freaking rewrote all my URLs and when I switched back to my previous theme it had wiped out all my customizations even though it was a child theme (those aren’t supposed to do that). Did a restore from that morning’s backup and back to the way it was with no issues. Yikes! Glad that worked out. Yes, this was so simple I went back and rechecked everything because I was certain something wasn’t done right, but it was. Since the church account has Google Drive access, I don’t have to worry about it using up my personal space. I’m using my Dropbox account – I have the paid account which is 1TB for like $99/yr. I might make the switch one day to AWS because they have the same thing for about $60/yr… it’s just the hassle of switching everything over to a new platform isn’t really worth the $30 savings to me just yet. I hear ya’. The church has a GMail account, so it is easy just to use ‘The Google’. Fortunately there is not much stored there, so I shouldn’t have to worry about paying anytime soon. The backups are actually not all that big. My current dropbox backup folder for websites is 54GB which might seem like a lot – but that’s 16 websites being backed up AND most of them are being backed up every day for 30 days retention. So I literally have 300+ full backups in the repository at any given time. I set mine for weekly, which is probably more often than it needs, but it can’t hurt. For the moment I am only retaining the last two, as the site is rather static. It is mainly informational, I post the weekly bulletins and quarterly newsletters, and the occasional sermon video. I go daily for 30 days because if a site gets hacked, I wanna be able to recover it – and sometimes if it’s hacked you might not see any symptoms for a while which is why I go back 30 days cuz you might actually have to go back that far to find a clean version. Good point, I’ll update the retention and frequency.